The man with the funny hair has a name, and his name is Rob Pinna. He is the Team 1 Team Lead for the Denver/Salt Lake City based team in Landmark’s Team, Management, and Leadership program. Ask Rob who he is and he will tell you – dad, husband, entrepreneur. Rob’s journey with Landmark began in 2007 when he completed the Landmark Forum after being introduced to it by Annie. Along with his wife, Katherine, Rob began the Team, Management, and Leadership Program in August 2013. Though Katherine chose to withdraw from the program after completing the first weekend, Rob continued on, both fully supporting each other in their choice. As dad, Rob has not only brought the new model of communication to his three kids, Renee, Nicole, and Jackson, and step daughter, Peyton, he has also brought his kids to the new model of communication. Both Renee and Nicole completed the Communication: Access to Power and the Advanced Communication Course: The Power to Create during Rob’s first two quarters on Team. Family conversations now show up inside the new model of communication, with authenticity and the ability to be straight with each other with no significance. Now, he is able to say no powerfully by realizing he is responding to a request, and saying no does not diminish, alter or devalue his son or his love for his son in any way. As husband, Rob is making a difference with his wife, Katherine, as well as ex-wives, Betsy and Arlene. Betsy completed the Communication: Access to Power course in Rob’s 2nd quarter. 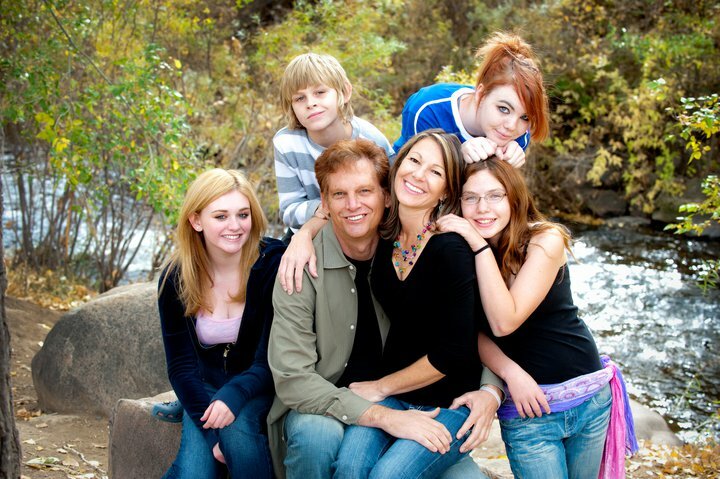 As entrepreneur, Rob is making a difference for thousands of other families as the founder of Cofamilies – dedicated to helping divorced parents raise great kids. Cofamilies is a coparenting calendar and mobile checkin application that coordinates schedules, finances and joint parenting decisions. Rob has also made Cofamilies his Game in the World, taking on a different aspect of building the business each quarter. In Q1, the Cofamilies’ iPhone app was created. Q2 saw Cofamilies become investor-ready. Now in Q3, Rob is creating a Cofamilies’ service for divorce coaching. Though Rob is no stranger to entrepreneurship, finding himself back in this particular saddle has been a challenge. After watching his very successful business go belly up in the early dot.com days, Rob stopped seeing himself as someone who could run a large company or be responsible for other people’s money. He took himself out of the business creation game and became a business consultant, helping others successfully build their businesses. Though very skilled in this role, Rob realizes that without his entrepreneurial spirit, his ability to contribute is diminished. Through his first two quarters in the TMLP, Rob has seen the limits his past business experience imposed on the success of Cofamilies. Instead of being focused on building a successful company, Rob’s focus was on not failing, losing money, or letting anybody down. He was afraid to step up to the plate and swing the bat, all the while comparing his level of success to that of his peers. For those who attended the February 2014 TMLP weekend, you may remember Rob on stage doing jumping jacks as he attempted to say and be the Denver Team possibility, being free to play. With fear of failure in the background, Rob was anything but. Now, halfway into the quarter, Rob finds himself getting in communication anytime he is disempowered and using recreation in all his conversations which has him free to make requests and not make the response significant. There is no winning, no losing, no failing, just freedom; the freedom to play big and know, if he swings and misses, there’s another swing coming. This is also showing up for other team members. The team just completed a home run Communication: Access to Power course in Salt Lake City, where a number of Denver-based team members traveled over the mountains to coach and support the course, some stopping along the way to play on the ski slopes in Utah. This represents a huge victory. A few years ago there were no communication courses or team members in Salt Lake City. Now, Salt Lake City is adding new communication courses to the calendar each year and new team members each quarter. With a near capacity Advanced Communication Course scheduled for June in Denver, the team is poised for growth and, like their Team 1 Team Lead, Rob Pinna, free to play. Brian is an alumni of Landmark’s Team, Management, and Leadership Program and currently lives in Boulder, CO where he works as an electrical engineer in the aerospace field. When he’s not sitting at his desk, he is usually sitting on a meditation cushion or bicycle seat, or writing poems and children’s books on the backs of napkins and receipts. Brian is passionate about organic food, real nutrition, and music, and is currently developing his skills as a songwriter and musician. The Possibility of this game is to provide affordable and effective lower back pain relief to the world. Dan was a hockey player and in 2004, he found himself having a lot of back pain and having to spend too much time and money going to a chiropractor. As he says, “I kept my chiropractor in business.” He set out to find something that was affordable and that would eliminate back pain. He went online and discovered this device called the rubber cylindrical ball. It was made in China and was used on animals. Why couldn’t it work for humans? This device is a rubber inflatable cylindrical ball. It comes with a pump and when pumped up it takes the shape of a hope chest or a child’s little wagon. You simply lay it on the floor, preferably a carpeted floor, and lay on top of it. You start out by laying on your stomach. You fully extend your body and stretch, then roll on your side, hooking your knees on one side, folding your body over the ball and using your forearms to block the ball, keeping it from rolling away from your body. Then stay in this position for 2 to 3 minutes or as long as you’re comfortable. 2 to 3 minutes is an adequate amount of time to stretch the body, as needed. Unfold your body and come back into compression SLOWLY and GENTLY! You do this as many times as you need to get your desired relief. This device is inflatable and can travel with you, wherever you go. It is so practical, inexpensive and IT WORKS!!! He gave it his own Brand…Back Blaster. He shared this device with his Chiropractor, Massage Therapist and hundreds of friends and interested people. He set up a website and provided a link to the manufacturer, in China, so others can also order these devices. He shared his Back Blaster link with sports organizations, college sports and hospitals. There are two sizes: Back Blaster Extreme, for men and Back Blaster Petite, for ladies. Portugal and Spain became two of his biggest users. He is now in the process of setting up a Lifetime Guarantee and determining pricing. This Game in the World is the only one that he’s played this year that has inspired him. For the first time, in his year in the Team, Management and Leadership Program, he felt like he was offering something to others that was truly valuable and that had a positive impact on their lives. He had discovered the true meaning of enrolling people to play his game. Enrollment was not engagement. He was inspiring people to get involved, not hiring them! What really inspired him was the fact that he never made a dime (and it doesn’t matter to him!!) on something that is such a great benefit to the world! What happens when you combine the super powers of Wonder Woman with fundraising and the dynamic leadership of Julia Molloy? You get Funderwoman! Funderwoman is Julia Molloy’s brain child and is a possibility that allows women to be successful and creative, while supporting a life they love. Born in Northern California, Brooklyn-based architect Julia Molloy had a vision to support other talented women around the world in their quest for financial freedom. Having completed school at Barnard and Columbia, Molloy now proudly spreads her talented wings at the Guggenheim where she is currently the Design Associate for the Abu Dhabi project. Architecture wasn’t Julia’s first passion. Her love for children gave her dreams of becoming a clown doctor. However, after living in Ghana and Italy during college, she decided that impacting the world and making beauty through building structures was the way for her. Julia was on a new path and committed to being an unstoppable force in the architectural design world. Julia’s expansive knowledge has allowed her to teach Architecture Thesis on the University level for two years. She also credits Landmark Education for contributing to her growth and development. The most influential courses for her have been the Communications courses and coaching in the Self Expression and Leadership Program. Embracing her love for travel, Julia has worked and studied in Caracas, Vancouver, Shanghai, South Africa, Istanbul, and Thailand/Burma, among other exotic places. Nathan: How did you select the women in your first class of Funderwoman? Julia: For Phase 1.0, our goal is to get our feet wet, so to speak, and to build a team and momentum. These women have been chosen for the first phase of campaigning and funding, because the diverse range of creative projects – from the practical – spice rack – to fantastical – twin world documentary (this is the project that the Manhattanite film maker created). It is beyond fascinating and a must see! Again, the big goal is to create an online micro finance platform for female founded creative projects throughout the world. Nathan: What calls you to philanthropy? Julia: As a young business owner of a design firm, XLXS, at age 27, my partner and I did not know how to source and manage money. Yes, we were “successful,” winning international design competitions, building small projects, and exhibiting and publishing our work, but we didn’t know how to earn a living. The first racket was that design school, architecture school in our case, didn’t train us properly for the real world, and then I created the possibility of a different model of working. I have won over $300,000 of grants and scholarships to fund my creative career, but at the end of the day, the money barely covers the project budgets, and sourcing and income out of this work is near to impossible. Potentially, the Funderwoman Foundation will sponsor loans for a curated batch of artists each year, so the Funderwoman will not only have the opportunity to develop a creative project, but also a financially sustainable model for her work. She will be able to pay for her own project as well as future projects in her career. The hope is that she will also eventually be able to pay it forward and sponsor future Funderwomen. I wanted to have a little fun with Julia, so I probed her with a few out of the box questions. Nathan: If you could choose a celebrity to endorse Funderwoman, who would that person be? Julia: Linda Carter – I guess. The icon of ‘having it all’ – fulfilling life while impacting the world. Nathan: So, you get this huge funder and are told you could have your headquarters in ANY building in the United States, where would it be? Julia: Tough question, most likely, I would want a network of buildings. The dream is to have field partners throughout the world sourcing artists and creative pitch videos predominantly in the Middle East, Africa, Latin America, Asia, as well as Europe, Australia, and North America – like the Kiva.org model. As far as the headquarters, I would love an old brick warehouse – adaptive re-use on the water for offices, event space for lectures, workshops, business planning and development women creatives. I would 100% like to be a part of the design of this facility. Nathan: What an even bigger dream of yours? What’s something that you’ve envisioned and would like to see it manifest itself? Julia: Funny you ask that question. March 13, 2013 is International Woman’s Day, on this day, I would like to have Funderball, which will bring together the foundation sponsors and sponsored, including the most extraordinary women in the world from creative to philanthropic – curators, artists, collectors, filmmakers, etc. The Fundraising Ball would be in the atrium of the Guggenheim. I can see Funderware being sold, Funderwomen rings for gold memberships and so much more. I plan to live and breathe Funderwoman someday, as it is what I am most passionate about. There are few people who leave a solid, productive career at Apple to start their own company. Todd Beauchamp is one of the few, leaving Apple to fulfill the dream of starting his own company, In2Technologies. 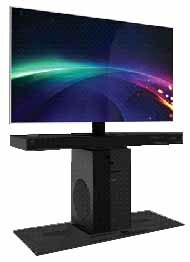 That company has just come out with a consumer electronics home theater product called Unity, and it has already won an award for innovation. Todd is a highly accomplished acoustic engineer. 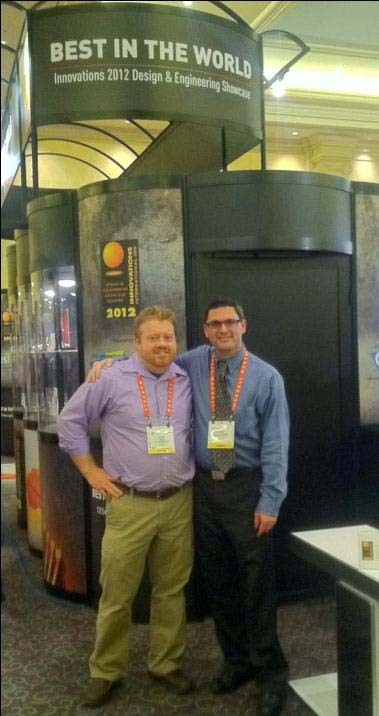 After working on projects for the US Navy, he joined American Technologies Corporation, ATC, in 1998. At ATC, he was responsible for research and development of their advanced, cutting edge audio technologies. Todd is the co-inventor of one of those, LRAD – Long Range Acoustic Device, which is one of the first devices ever to project a concentrated beam of sound waves. It is used for hailing and signaling, and in the military and commercial sectors as a non-lethal deterrent. It became famous for when it was used against pirates by the Queen Mary and other ships, and will be present with security forces at the London Olympics this summer. At Apple, he ran the audio lab for the accessories group, responsible for anything connected to the iPod or iPad, and he worked on the final acoustics of the first iPhone. He was responsible for the ubiquitous white Apple earbuds, the company’s highest shipped product ever at over 200 million units. Todd completed two years of the Team, Management and Leadership Program in 2011 in San Jose. Kimchi Chow interviews him on his experience of the program and how participants can get the most out of it. How did you come up with this business idea, and in which quarter? The idea came from a dream I’ve had since 2004. I then faced some hurdles during that time, so I stopped. When I was in my 2nd quarter of Team, I brought this back as my project, and I pursued it throughout my 2 years of being on Team. Each quarter I reached a major milestone to fulfill my dream. 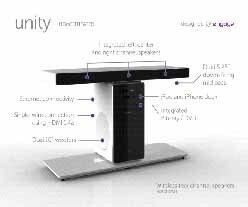 My project is about a product called Unity, a new home theater platform. It provides a great way for people to enjoy their audio & video everywhere in the world. As you know, music and movies are a huge part of our culture, and cultures throughout the world. I see an opportunity to provide a way for people to connect with their music & video. When did you make the transition to creating a company that is now internationally recognized? In April 2011 I completed the second year of Team and left Apple at the same time. I started my own company and brought this product to introduce to the world. Now I have a small team working with me. We just won a 2012 Innovation Award from the Consumer Electronics Association. We were named number 8 of the top 20 companies in the world in innovation for 2012. There are about 30 articles written & published in Fortune Magazine, Business Week, USA Today, Fast Company, CNET, Home Theater Magazine (June 2012), etc. All that press has potentially reached 30 million viewers as of today. You shared with Team San Jose recently that you want us to do a project that’s worth doing. A project that will impact thousands or even hundreds of thousands of people, for several generations. What do you suggest we do to get in touch with that big vision, since most us tend to propose small projects that impact only our personal lives, or at most impact less than a hundred people? Most of us when we come onto Team, we still see the world as we have to do things by ourselves. When you take on the Team Design Statement of “Building teams and teamwork in any situation”, what seems impossible when you do things by yourself will be possible when you build team around it. We have so many concerns that are getting in our way that keep our project small. One suggestion is to write down all of your concerns about your project on paper. Play the “what if” – let your mind wonder, “what if all of these concerns were gone?” What would be possible if you now create what you’re going to do from nothing. The most important part here is getting connected with the outcomes- visualizing the experience of people, the positive impact of your project in people’s lives. When you connect with the positive impact, it will help you deal with your concerns and get them out of the way. You will know when you connect to a project worth doing when you feel very emotional about the impact it can bring. Once you connect with the impact, use the Team 1 & Team 2 Design statements to build teams and cause leaders around the world to fulfill that dream, and it will become a reality. What is the process that you used to overcome the challenges or concerns that you’re facing while building this company? Could you give us some specific examples that worked for you? My old way of my being would be to fire people who don’t perform, and find someone new. My new way of being is to re-empower team at all times, so that we as a team will get the dream fulfilled. By having the project that’s worth doing, it pushes me to use all distinctions from the Landmark Forum to the Communication Curriculum- when-ever or whatever is appropriate, to move the conversations forward and be successful. Understand that every person on this planet has a story about the world that can get in their way. Once in a while, their story pops up and they are not at their top performance. This understanding allows people to be in their humanity. Just be with them, recreate the experience, and re-empower them. Looking back on your journey, you were in the Team, Management and Leadership Program for 2 years. What are the top 2 or 3 things you would recommend team members get developed in so that they get the most out of this program? Play the game that is worth playing in each quarter. Get every bit of coaching possible until you are touched, moved, and inspired by the game you are playing – your project. what you’re doing forward. Take every opportunity to be accountable for something no matter how scary it is. The more you can take on, the more you grow, and that’s why you are on Team! It’s not about what we have to do or to work at when we are taking on accountability, it’s about giving things up! Giving up the identity of who you think you are, and the conversation “you are not good enough.” Just give up the poor and crappy listening we have of ourselves. When you give this up, your natural leadership will show. In what way did the experience for being on Team transform your life? With my company last week- rather than firing people who hadn’t performed, my old mode of operating, I re-empowered the whole team to play at a level that’s worth playing at. With my family, I have learned to master the distinctions from Landmark Education and bring those distinctions to effectively remove 35 years of anger & anxiety between two members of my family in just one conversation. Chi explains, “It has been my dream to join the Team Management and Leadership Program (TMLP) at Landmark Education to create a business, so this is a dream come true!” And when her love for both fashion and business resulted in a fashion business with a cause — to support designers and enhance women’s beauty — the dream was complete. In addition, Chi also holds a full-time marketing job. Just how does she do it all? “Without the team structure of TMLP and what I’ve learned from Landmark’s communication courses, this definitely would never have happened,” says Chi. At one point, Chi and her partner had not heard from the web developing team based in another country for an extended period and multiple project deadlines had been missed. Before getting this training, Chi reports she would have just written off this team and angrily started interviewing new firms. Instead, she was able to see things from the other’s viewpoint and scheduled a conversation during which she learned about what was going on with the design team, cleared out what was in the background for each of them, and agreed on how best to communicate moving forward and created an appropriate timeline. A concrete result of this conversation is the team agreed to add a web designer to aid the coding team by preparing the html files before sending them to coders, reducing the team’s workload and offering more options to the site. 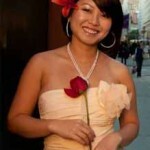 Since completing the first year on Team, Chi set out to be a successful entrepreneur and she refuses to stop there. Drawing on the structures she learned on Team to create effective results, Chi incorporated them into her business. One of the structures she employs is to have a business coach listen in on her weekly call with her business partner, creating an environment where each partner feels heard and is committed to collaboration and partnership. This has transformed their conversations, allowing them to communicate without drama or making things up about the other person, while maintaining their joint focus on their promised actions and results. In August, Chi will re-join the Team, Management and Leadership Program for a second year dedicated to the practice of empowering leaders in her business and building the leaders of Team New York. Now that Chi is consistently connected to her business team, she is able to flow with the work process and not feel frustrated or that something is wrong. 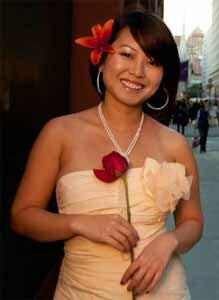 “I’ve got enormous peace and freedom to do what I love to do — both with MyRentDress.com and in my full-time job,” Chi concludes. And that’s a beautiful thing. Kimchi Chow interviewed Robert, discovering how he got started on the project, what lights him up about the business, and how being on Team is supporting his success so far. How long ago did you start with this business, what is your role in the business and what is the product? I got started with the business idea a little over two years ago; the original idea came from my partner. I am essentially “productizing” it—putting the components in place to make it viable to sell, and creating a business plan. My titles are CEO and President. The charter of the company is to take stuff that is typically put into landfills, inert materials that don’t break down, and use them as building materials. The current product is called AmeriSlate. It is a roofing material that, in its first incarnation, is being made recycled tires. Tires are ideal as a roofing material; they are engineered for longevity, provide excellent insulation, don’t allow UV light to pass through and are strong. I actually drove a railroad spike through our product, and it didn’t leak, it’s self-sealing! AmeriSlate is not damaged by hail, even the big stuff. Hundreds of millions of dollars in damage is caused annually by hailstorms in Texas alone. Insurance companies often offer rate reductions for this type of roofing. It also looks good; we can create a product that has nice depth and texture to it. What inspired you to start working on this business with your partner? It’s an awesome product. It aligns with things that are important to me and provides a solution to a number of problems: we are making something from “nothing” so it helps with a huge environmental problem. We are actually removing carbon from the environment so we have a negative carbon footprint.t A portion of the product goes to providing building materials for housing projects for people without homes—to organizations like Beautiful Day and similar groups. Over 350 million tires are disposed of annually in the US alone. Tires don’t break down so we are helping solve a big problem by making a useful product from them. We are also partnering with a company in Australia that produces roof coatings that have up to 91% thermal reflectivity, even on a dark material. In Australia, four out of five people develop skin cancer of some kind, due to the depletion of the ozone layer over their country that is letting in way too much UV light. When applied to AmeriSlate they have the added benefit of reducing heating and air conditioning needs, and lowering the associated electrical bills. One guy in Sacramento reduced his electrical bill by $200 per month in the summer. Do you see it becoming more popular than traditional materials? Yes. It is much lighter than actual slate, at a fraction of the cost, it has better thermal properties, it is likely to last the better part of a century on a roof, it is a green product and it looks good! What do you plan to accomplish with this project by the end of your first quarter in the Team, Management and Leadership Program? I intend to have 1.3 million dollars in funding in place for the product. I currently have three investors I’m talking to. One is Erin, who I was referred to through another participant on Team in connection with a different project we started discussing our own projects as a sideline. It turns out that she had started Team some time back with the goal of raising half a million dollars by the end of her first year. Part way through her third quarter, she had raised 1.4 million dollars and decided to leave the program to start her business. She then grew it into a 20 million dollar company and sold it. She has rejoined Team and her project this time is to help others starting companies to put the infrastructure in place to do that successfully. The power of being on Team is this: in working with your Team, being related to the people on your Team, having the Team surrounding you—there is a light shining on your blind spots, on the areas where you “don’t know what you don’t know”. There is also a team of people there to support you in transforming those areas. Each person on the team has their own unique strengths, and you get to see those, and as part of the team structure you can try out those aspects yourself, and that’s what really empowers you in your project. What would you recommend to others with a similar project, if they are stuck getting funds or investors? Get involved in the Team, Management and Leadership Program! Share. Put your project out there. Talk about it. We inspire other people when we share what we’re up to, and that makes them a part of your team! You have had challenges building this business. What are some examples? My biggest challenge is myself and me getting in the way of the things I’m doing. One example of this is I’ve always had to have everything figured out before I would take the first step into something new. That really limited what I could do. When I was taking the Landmark Forum I saw that clearly. I was able to start to let that go and get moving in the world. Now, I take the steps without needing to have it figured out. By talking and taking action, things start happening around you to support what you’re doing. No one has to have it all figured out. Move in the direction you want to be going and watch things come around to support it. How did you move yourself out of the way, so that this project could move forward? I recognize my tendency to need to have everything figured out first, and when I see myself going that way, remember that I can get out of it and start taking actions. What’s really empowering is trusting in the relationships with my Team. Reaching out to the Team, using my Team members, remembering I have that resource, rather than getting stuck in having to figure it all out. When I talk with them about where I’m stuck, it gets me back into action. What do you see as the value of the Team, Management and Leadership Program? Now when I have a block of time available, I think, “How do I want to use this time effectively?” Maybe that’s to do nothing, so I say, “OK, I’m not going to do anything”, but I’ve made that conscious decision. Usually, I’m thinking, “I could do this… or I could do that…I could slip this in here…” That mindset is very powerful, it has caused me to move more powerfully in my life and my projects. Do you have everything you need right now to succeed at your project? Had you asked before I did any courses with Landmark Education, I’d have said, “No. I don’t have what I need.” Now, having done the Landmark Forum, and the Communication Courses, I realize that I do have everything I need. I may not see it all right now, but I trust that by stepping out powerfully and speaking about what I’m creating, the things I need will be there when I need them. What is the one thing you recommend people do to find their passion, as you have found yours? Ask yourself what it is in your life that creates excitement, love and affinity. What is it that gets the juices flowing, that makes you want to get out of bed in the morning? What allows you to find meaning in what you’re doing? What is that thing? Then talk to people about it, get it clear, make it real; refine it, clarify it in talking with others. There is something there in the core of our being that wants to come out! Anuj Singhal, a participant in Landmark Education’s Team, Management and Leadership Program in Vancouver, has created a project to bring a new context of possibility to the media, going beyond what he was ever capable of doing himself. Imagine a world where energy is concentrated into the creation of health rather than in battling illness. It is time to move from a world of duality to a world of unity fusing to its inner beauty. Communing with our inner self opens us to a magnificent world of wisdom. Imagine a health centre reflecting our own inner beauty. I have a dream that has lived inside me for a long time, I carry it preciously, and as the veil lifts I feel in my very inner self that it draws near to being a concrete reality. I have no longer any doubts. Moved by the vision of creating health, I registered in the Team Management and Leadership Program in February 2007. My name is Suzanne Raynauld. I have been trained as a nurse in community health. The profound desire to take care of others has always guided my actions. Important health problems with my shoulders brought me to Reiki, a sacred art of transformation, letting life’s energy circulate within us. I became A Reiki Master in 1991. As the Director of the Centre de Santé-Reiki Lanaudière, founded in 1992, I am devoting my life to Reiki in the Japanese tradition. After so many years in nursing spent facing illness day-to-day, and with my desire to leave as a legacy a world of peace and love, I truly got that my mission is the creation of health. But how to realize that dream? Then a vision came to me—that of creating a model centre for holistic health inspiring a world of health. What a vision! I have been working on this project since 2005 and I have gathered around me a team of 7 persons, a group of natural health practitioners and business people meets on a regular basis. The long term goal—within 5 years—is to implement a pilot project based on the Centre’s operations and to develop an extraordinary environment which will allow each and everyone to take charge of their own being and create their own health. We are currently creating a unique business model which can be franchised and exported. Our product is the creation of health at every level, physical, mental, emotional and spiritual. I let myself be inspired by the vision of sacred space where individuals, organizations and the entire collectivity discover the access to their inner power. The moment has come when together we can build, when each of us is the carrier of this New World, when it is time to make this a reality first within us then letting it spread like a contagion of love to those around us and to the whole planet. Learning in each moment to celebrate life within us and around us is the beginning of endless beneficial change.What could be more marvelous!